Inspired by the Women’s International Climbing Meet in Llanberis a few years ago, Charlie Low and Ellie Fuller set up the Women’s Trad Festival to encourage people to take the next step in their climbing. Whether you’re looking to attempt your first lead, push your grades or even climb outside for the first time – the weekend is all about picking up new skills and meeting likeminded people. Having been slow to spot the date of the 2017 festival I was gutted to see that tickets had gone having sold like hotcakes. However, I was in luck! Shortly after starting my new job at Rab, I was told that as sponsors of the event I would have the opportunity to attend if I was available. Still relatively new in the office I refrained from a whooping, vehemently guaranteeing I was definitely free – any plans for that weekend would be postponed! Although primarily aimed at women, WTF is open to all ages, abilities and genders. Before an event like this, I’d usually have some doubts as to whether I was a good enough climber or if I’d be able to keep up with the people around me. However, encouraged by the friendly relaxed tone of the festival, this time I didn’t worry at all. 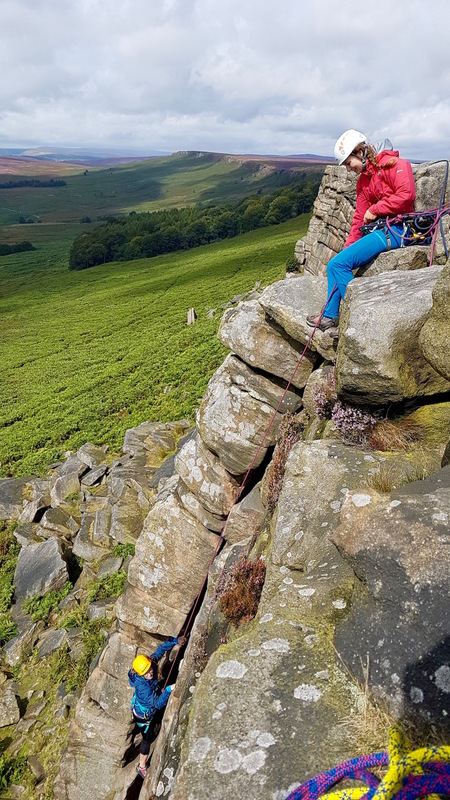 Flocking from all over the UK, there was a broad mix of climbers and even a few dogs tagging along for good measure – I knew I’d fit in somewhere! The first day of the festival was typical for August in the Peak District; it was raining! Starting off as a fine drizzle, the weather quickly worsened to more persistent precipitation. However, this didn’t stop plans from going ahead! Sticking to easier routes and focusing on gear placement, everyone just threw on a waterproof and got going – unsurprisingly, we had had the crags to ourselves. I’ve never climbed so many routes in the rain before! Far from dampening spirits, it seemed to have upped the ante and returning to camp that evening the atmosphere was buzzing. Kate climbing in the rain! As a participant you’re paired with a more experienced leader either by yourself or with one other person – this means you pretty much get one to one or one coaching, and their enthusiasm is contagious! Before the start of the weekend, attempting to lead an HVS was a bit of a pipedream – something I considered trying later in the year. But after a fantastic first day and an evening spent chatted to everyone around the fire I somehow decided that there was no time like the present! Over the crux! Tody’s Wall – my first HVS lead. The only downside to having so many awesome climbers in one place is that over the course of the weekend you can’t help but eye up everyone else’s (climbing) rack. From microcams and shiny nuts to pretty chalk bags and brightly coloured ropes – expect to walk away with a wish list longer than your arm! That being said, I’m a magpie… Santa will be informed, but in the meantime, I need to start saving the pennies! Tamaris from the BMC taking on (and smashing) her first lead! Packing up at the end of the weekend, I realised I’d taken far more from the festival than my goodie bag and brilliant bright orange Crimp Tee. To start with there was a whole host of people I wanted to go and visit for various climbing adventures, then aside from that, there was also now a long list of routes to ticks. When it comes to climbing I’ve never really set myself goals or aims, however, inspired by the festival and everyone I had met – I think this had changed. Bring on winter and the elusive grit season! As I am sure you can guess, I’m a big fan of Women’s Trad Festival and would recommend going to their next event in a heartbeat! If you’re keen to find out more and keep an eye out for key dates, check out the Women’s Trad Festival website or follow them on Facebook. Previous Baby steps up big things. Next It’s okay (not to be okay).